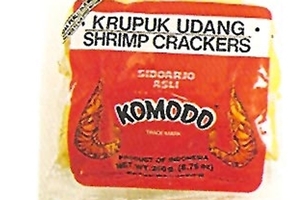 Komodo Medium Shrimp Cracker (Krupuk Udang Sedang) in 17.5oz (500g) Pack. Estimated size 5x8cm each. Un cooked - Frying Required. Comodo Shrimp crackers (Kerupuk) taste great by themselves or with your favorite chip dip. Perfect as a snack or as an appertiser at lunch time, parties or picnics. Komodo Shrimp Crackers require frying (preferably in a deep fryer) until golden in color, it expands to about 3 times its original size. Kerupuk Udang Kecil Asli Sidoarjo Cap Komodo. Tidak Perlu Di Jemur, bisa langsung di goreng. Mengembang 3 kali ukuran sebelum di goreng. Product of Indonesia. Halal Certified حلال . [3 units] Limit 2 per customer!